If you’re looking for a home remedy to naturally control your rodent problem, look no further than peppermint oil. Peppermint has a long storied tradition of being used in aromatherapy and folk medicine to aid in treating digestive issues or even go so far as enhancing a person’s memory. One of the more obscure uses for peppermint, however, is as a rodent repellent – I’m guessing that’s probably why you’re here. I bet you’re wondering how effective it really is as a mouse repellent and what do you do with it? Stick with me through the end, and you’ll know everything you need to know about using peppermint oil for mice. Believe it or not, it’s a surprisingly effective way to deter mice. I’m not going to sell it to you as the magic bullet to solve all your mice problems though. There’s no such thing, and really this is only one part of a larger plan. You still need to cover all the bases if you want to keep your home mouse free. Mouse prevention is about sealing access points to keep them out from the start. It’s about sealing food containers and eliminating their source of food: no food = no mice. The reality is you’re not going to be able to plug all the holes though. The hole doesn’t have to be much bigger than your pinkie, and mice can still get in. That’s where the peppermint oil comes into play. When you talk to different people about the effectiveness of this method, the responses are almost polarizing. Some people claim great success. Finding this method was the next best thing since sliced bread. Others say it’s a worthless, a waste of time and money. What do I think? I’m somewhere in the middle, leaning more towards it works. My guess is that some people think peppermint oil is the answer to all their prayers. If they see one mouse after applying the oil, it was a complete and utter failure. Stop and think for a minute … how many mice they could they have had if they didn’t use peppermint oil? I realize there’s no way to answer that question, but could it have been a lot worse? Maybe they were actually forcing the mice out into the open by repelling them from their nests or food sources. I really don’t know, but when so many people say such good things about the method, it’s worth trying to see if it works for you. Have you ever read the ingredient list of those commercial mouse repellents in the store? Do you want to know what virtually all of them have in common? Peppermint oil. OK, so it might not be that big of a secret since frequently the ingredients are printed right on the label, but I just saved you the time from having to actually read it. Yes, they do have other ingredients, and I’m sure that probably plays into their effectiveness as mouse deterrents, but peppermint oil is one thing they have in common. To me, that says a lot about this essential oil and the role it plays as an effective mouse deterrent. How do you use peppermint oil for mice control? First of all, you should know something about mice. Mice “see” with their whiskers and nose. They have terrible vision, but a very keen sense of smell. It’s this keen sense that enables them to find food. This is where peppermint oil comes into play. It works because the scent is so strong it overloads their olfactory organs. If you’re preventing them from using their nose effectively, they essentially go “blind.” They can’t find food because they can’t smell it. This is key. One of the things I frequently talk about on this site is how mice gravitate to food, and their nest is usually nearby. If they can’t find food, they have no choice but to move on to the next place. The other thing you need to know is that you have to make sure you’re using 100% pure peppermint oil for mice problems. Don’t use peppermint scented products for getting rid of mice because typically the peppermint scent is so diluted, it’s not nearly as effective. 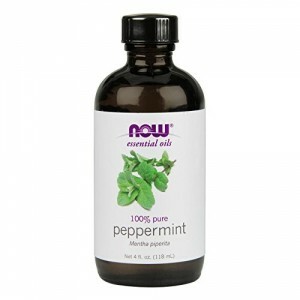 Don’t use peppermint extract either – it’s not the same thing, and won’t work as well. Make sure the label says “pure peppermint oil.” The scent needs to be strong in order to be effective. Now there is a lot of ways to apply peppermint oil, so I’ll give you a couple my favorites. The first method, and one of the more popular, is to simply take a few drops of undiluted oil, and apply it to a cotton ball. Don’t be stingy! Remember, for this to work, the scent has to be strong enough to overload their senses. Oh, yeah… Don’t just use one cotton ball and expect this method to work either! Grab a handful and create your very own do-it-yourself mouse repellent. Once you’ve done this, place a cotton ball or two everywhere you suspect mice may be or would want to be. Good places to start would be where the food sources are: your pantry or kitchen cabinets to name a couple. Also place them both high and low. Mice are excellent climbers, and you’d be surprised where they can get into. This isn’t a “set it and forget it” solution. There is some upkeep and maintenance when using peppermint oil as a deterrent. As the smell fades, you’ll want to reapply. Remember, it’s not the cotton balls that are keeping the mice away, it’s the scent of the peppermint oil. Cotton balls actually make great nesting material, so maintaining this isn’t something you’re going to want to shirk on. TOP TIP: if you’re feeling particularly vindictive and want to show those mice who’s boss, mix the peppermint oil with cayenne red pepper, and dip the cotton balls in the solution. Not only will the peppermint oil repel the mice, but should a particularly brave mouse decide to approach the cotton ball after the scent has faded, it will be in for a burning surprise that will surely turn it running in the opposite direction. Another good option to apply peppermint oil for mice, is to create a mixture and use a spray bottle. Add 2 teaspoons with a cup of water and mix thoroughly. It’s sometimes helpful to warm up the water first (it doesn’t have to be boiling hot, just warm) which will facilitate mixing the solution together. Just as with the cotton ball method, spray it everywhere you suspect mice may be. Want to spice it up a bit? Again, mix in a bit of cayenne red pepper into the solution. Be careful though as you want to make sure not to inhale those fumes. The cayenne red pepper is some potent stuff and could cause burning and irritation. Not to sound like a broken record, but again, this is only effective for as long as the scent lasts. You’ll want to reapply it regularly as the scent fades. Once a week should probably be sufficient. Is peppermint oil safe to use around pets? If you don’t have pets, feel free to skip this section and move on to the next. Funny story… I’ve actually heard some people say, “We have two cats, and we’re wondering if it’s safe to use peppermint oil around them…” Wait, what?! You have cats?! Why do you have mice??? Sounds like you need to have a chat with those cats because someone’s laying down on the job… I’m just sayin’. In all seriousness though, the scent won’t bother your pets. That being said, you should probably keep the cotton balls out of reach though. You really don’t want your dog or cat to eat them, or move them. They sort of lose their effectiveness that way. If you do ingest enough highly concentrated peppermint oil, it can be toxic, but there really shouldn’t be that much out there. Like all things though, just use some common sense. You’re not going to stick a snap trap where your dog is going to stick its snout in it, so don’t do it with the peppermint oil either. Problem solved. Where do you buy pure peppermint oil? This bears repeating: You need to use 100% pure peppermint oil. If it doesn’t say those magic words on the bottle, then it’s not what you’re looking for. There a quite a few brands out there, and quite frankly I’m not sure how much of a difference it really makes. You’re trying to get rid of mice, not cook at a Michelin star restaurant. Find the best deal and run with it. Some people have reported a tough time finding it in their local stores. If you’re one of those people, or you prefer the convenience of ordering online, I’ve provided a link to the right stuff on Amazon: 100% Pure Peppermint Oil. There are probably a few different sizes to choose from. My recommendation is just to pick the one that is the most bang for the buck (and if you’re an Amazon Prime member, one that will ship to you in two days). You’ll almost certainly want more than an ounce though. Depending on the size of the area you’re trying to defend against mice, you could go through it fairly quickly, so keep that in mind. And that’s all there is to it. You now know how to use peppermint oil to get rid of mice! Any questions, please feel to drop a note in the comments. I don’t know if you’ve heard, but peppermint is supposed to be good for you if you have breathing problems. Solve 2 problems with 1 product.